The Lope: Santas with giant boots - what's up with that? In my quest to pry into other people's homes and businesses in order to research the history of holiday store window display pieces, I run across the mystery of Santa with a giant boot quite often. 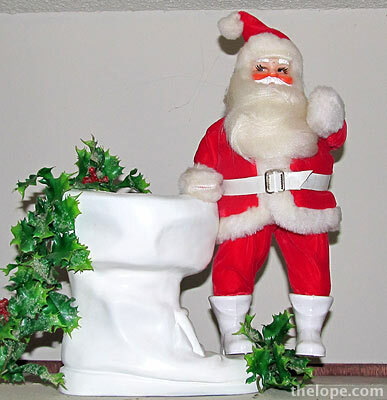 Or is it a diminutive Santa with a normal-size boot? I don't know, and I don't understand in either case. A friend of mine said the one above looks like something you'd see in a nursing home. This and the example below were made by the Harold Gale display company (defunct) of Kansas City, though I think other companies may have made similar items. I've no clue as to the date of the one above, though it has an angel hair beard so it's a ways back. 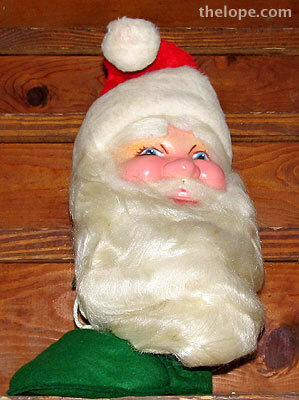 This Santa head in a felt and cardboard boot was made in 1970, if the dated newspaper found stuffing the boot is original to the piece. This one really messes with me as it would seem to imply that Santa has been decapitated, unless he is popping out of another dimension with the boot as the portal. Maybe he does this with chimneys and flues and he uses his own boots for practice? Harold Gale even made an automated version of a Santa head and torso wiggling around as the Jolly Old Elf seems to emerge from a boot. Did someone at Harold Gale, in a desire to crank out quickie product, say "hey, we've got all these boot parts from larger Santas and some small Santas. Let's Frankenstein some Santa stuff together"? I can suspend disbelief for flying bio-luminescent reindeer and time-folding Kringles, but the big boot/small Santa thing doesn't work. What kind of boots then, does Ace wear when he dresses up as Santa? ?